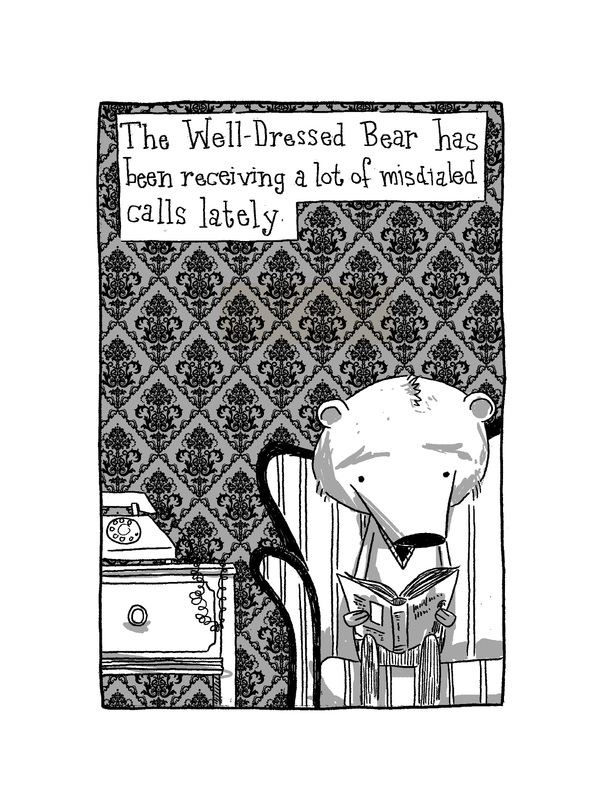 The Well-Dressed Bear Will (Never) Be Found, by J. Roselló. Atlanta, Georgia: Publishing Genius, August 2015. 210 pages. $14.95, paper. The titular Well-Dressed Bear of J. Roselló’s The Well-Dressed Bear Will (Never) Be Found doesn’t seem to ever finish reading his copy of Italo Calvino’s if on a winter’s night a traveler. I myself read it almost a decade ago and remember almost nothing of it: ten Calvino-original first chapters of ten different novels alternating with ten postmodern destructions of different facets of writing, reading, buying, selling, publishing. I think it’s a great book I don’t understand at all, as if the Emperor is indeed wearing clothing, but it’s all from Björk’s closet. 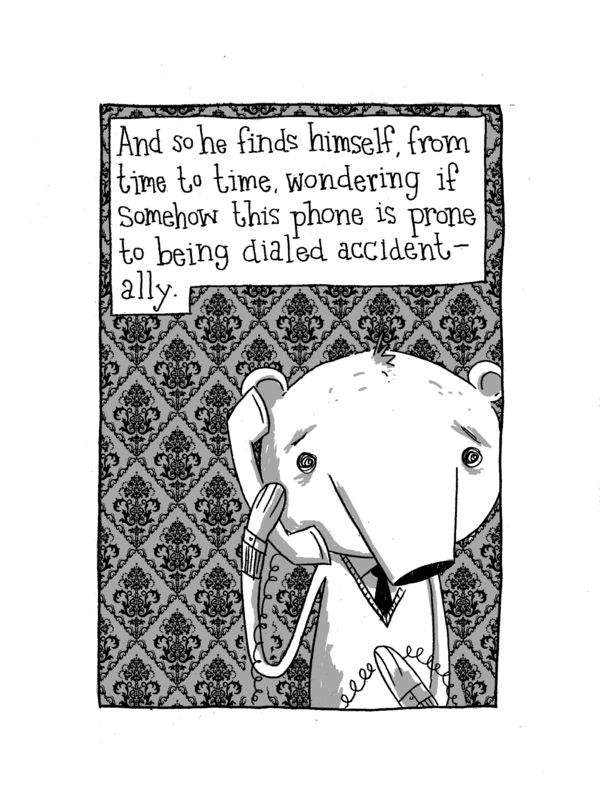 Roselló’s Well-Dressed Bear lives in a world in shambles, answering the phone over and over again, never hanging up though the call is never for him. As with most good metaphors, this doesn’t require a load of coursework to both comprehend and connect. The nihilistic tendencies that could be read into are only as meaningful as what it’s rejecting. Buildings are on fire, storefronts are broken down, streets and sidewalks are a mess of debris and failure, and the goddamn phone won’t stop ringing, sure. 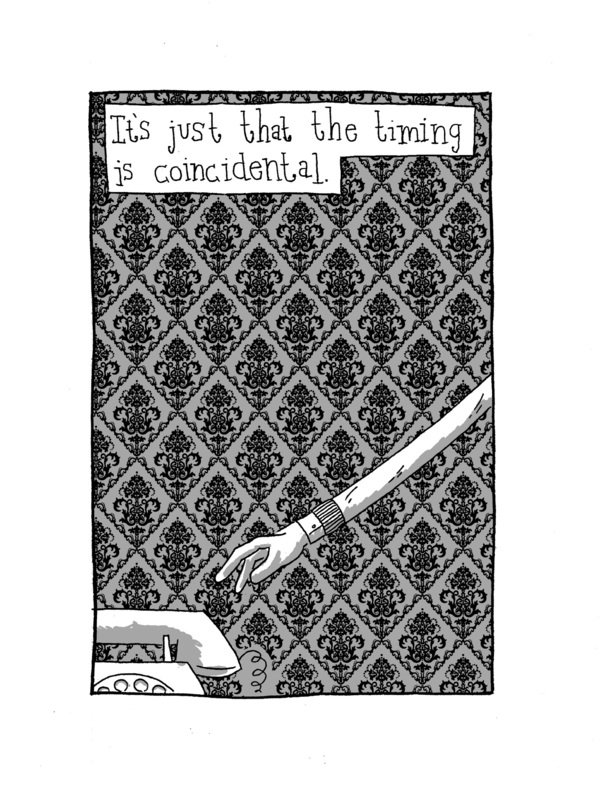 But there’s a feeling of surrealism that turns this into a weird reality that isn’t quite alternate enough, a cautionary tale told a minute too late. At one point, The Well-Dressed Bear walks out of his apartment, still on the phone, the coil cable following behind him, stretched taut and never ending. At another point, he walks through a wall. In terms of perspective, it lets us know that the Well-Dressed Bear is in danger of not fighting the good fight or even being a part of it. What other people we see in this world, assuming the Well-Dressed Bear counts as “people,” are hooded, faceless beings whose shape resembles a half-dozen empty socks. The Well-Dressed Bear himself looks like Mr. Rogers: tie, v-cut sweater, slacks. It’s the sort of look for which there is no place. It’s antiquated even in our very own saturated world where there’s an over-awareness of every style that exists. “Well-dressed” covers it all too perfectly, like the word “nice” or “pleasant.” While the Well-Dressed Bear’s identity is wrapped up in his look, it’s wrapped up in what he isn’t, as well. The Well-Dressed Bear has no choice but to define himself as this weird middle ground between Jonathan and Not Jonathan. At times, he puts on a mask and becomes a double of himself, a human form identical in every way except not being a bear. The calls from the woman intensify. We begin to get these weird chapters of the book that strip down the art even more. There are no backgrounds, no shading. What was somewhat of a heavily sketched style becomes its essence. Not minimalism, just austerity. Those flashes to a stripped-down world show how proficient and tasteful the art really is, as these particular chapters have white space for days to show, yes, the typical emptiness, but also to gel with the narrative itself: a more streamlined focus, less to see overall. I started to wonder if The Well-Dressed Bear actually is Jonathan, or could be willing to pretend to be Jonathan. He appears to see the possibility of relief in being Jonathan, to be one thing to this one person, taking comfort in her comfort. Of course, this means there is a risk of conformity. And, of course, that means there are the benefits of conformity: ambiguity, escape, a faceless peace of mind. And, of course of course of course, that means there are the pitfalls of conformity: ambiguity, escape, a faceless peace of mind. So, back to Calvino. Would the Well-Dressed Bear have learned anything from finishing if on a winter’s night a traveler? Maybe, but maybe he’d be too busy, like most of us, living a version of the story, a version of the heady framework that pieces it together, being interrupted over and over again by a madness that, contained within, is an escape from one identity to another, an opportunity to be a world within a world. There exists for him and for us all a fear of what we may become, what we may already be.